I'm very happy with Japan Deluxe Tours. Overall, I'm very happy with my experience using Japan Deluxe Tours to book this trip. 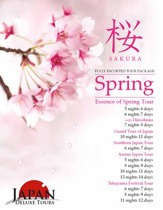 The Grand Essence of Spring Japan tour package we selected was wonderful. Last lunch had a great view.